With over 500 attendees and dozens of presentations on virtually every topic in informal and experiential Jewish education, NCSY’s YouthCon, held on August 19 at the Stamford Hilton, was a smashing success. Among the many participants was Jon Gross, senior rabbi at the Beth Israel Synagogue in Nebraska. A steady twitter-er during the conference, he described the experience as "absolutely amazing!" "It may be the only conference that brings together leading Jewish institutions ranging from the Orthodox Union, Yeshiva University, Chabad, Jewish Theological Seminary, Camp Ramah, Aish Hatorah, UJA Federation and over 150 others representing every denomination, ” he wrote in his blog American Rabbi. For Rabbi Gross, the highlight of the event was a heated, but friendly, debate between Omaha’s Joel Alperson and Ilan Caplan, of the American Jewish World Service. The two discussed the nature of Tikkun Olam in the Jewish world. Over at Baltimore Jewish Life, Gobbie Cohn, youth director at Congregation Toras Chaim, wrote about his own experiences at YouthCon. For Cohn, the best part of the day was one of the many informal networking sessions held during the conference. Youthcon was in sharp contrast to that perception. Another point Rabbi Emerson raised was the low cost of the event: only $36 for the full-day conference, including a fully catered lunch and snacks throughout the day. “They wanted as many people as possible to attend, and they did not allow cost to serve as a barrier,” he wrote. Rabbi Emerson raises an important point about the nature of Jewish education and we thought we’d quote it in full. 1. What are you going to be presenting on at YouthCon? I’m going to be presenting a groundbreaking and innovative tzedakah curriculum – the first-ever school curriculum released by American Jewish World Service – called Where Do You Give? that will change the way you — and all of us — think about giving in the 21st century. However, this won’t just be a curriculum presentation. Through this curriculum you’ll learn how to empower the next generation of young people to use the power of tzedakah to have a deep and meaningful impact in the world. Also, all participants will gain invaluable skills in integrating social media and interactive online tools with Jewish sacred texts and history in new and exciting ways. You’ll also be able to experience the curriculum first-hand, learn how to build a culture of tzedakah in your community and network with other educators around how to adapt our resources for your specific needs. You will also be able to — wait, I don’t want to give it all away! Tzedakah hasn’t changed. The sacred commandment to give of your resources in order to help those less fortunate and to create a more just and righteous world hasn’t change and will never change. What has changed, however, is where we give tzedakah, how we give tzedakah, and how we make those decisions. Today, we’re more likely to give by writing a check or making an online donation than by collecting coins in a tzedakah box. Today, what denotes our “community” — and therefore those we must care for — can mean everyone from our neighbors in a five-block radius to our camp friends who live across the country to ethnic tribes fighting for their rights in Cambodia. Today, we have to think differently about who we’re obligated to in our increasingly interconnected, global and technologically accelerated world. This brings on a whole slew of new questions and challenges. But if we want to fulfill the mitzvah of giving tzedakah in a thoughtful and impactful way, then we must address them. This is my first YouthCon, so I’m excited about everything! My goal is to meet as many people as possible, since I know the rooms will be filled with enthusiastic, bright and passionate educators who are all here because they want to create a better world by inspiring the future leaders of it. If that sounds like you (and it should for all of you), then I’m really excited to connect with and learn from you. See you soon! Sasha Feldstein works in the education and community engagement department at American Jewish World Service and manages “Where Do You Give? Reimagining Tzedakah for the 21st Century.” Prior to working at AJWS, she participated in AJWS’s Volunteer Corps by living and volunteering with the Heshima Kenya organization in Nairobi. She is also an alumna of AVODAH: The Jewish Service Corps. She is from Los Angeles, CA. 1. What is the goal of YouthCon? At NCSY, the international youth movement of the Orthodox Union, we realized that education is changing. The challenges educators face today — while I wouldn’t say they are harder — are different than the challenges educators faced twenty, even ten years, ago. I’ve seen the changes in the education of my own children. When Aryeh started school, cell phones were barely a rumor; nowadays, my youngest, Ayelet, is already clamoring for an iPhone. Jewish education, especially informal and experiential education, where most of our youth get their information, needs to adapt. We’ve brought together an impressive array of educators and practitioners under one roof for one day to understand how we can maximize what and how our teens and students learn. 2. What do you think of the effect of technology on the Jewish community? Technology is simply a tool. It doesn’t have an effect in of itself; it’s how we use it. For NCSY, technology has been an invaluable asset. It allows us to have unprecedented levels of interactions with our teens. A small example of this is the hundreds of teens that learn about NCSY activities through Facebook groups and twitter feeds. Additionally, as part of our 300 JSU Clubs, we meet with thousands of public school teens every month and we need to understand how to talk to them. We’ve recruited the best and the brightest for this conference — not just the presenters, but also the participants. At YouthCon, everyone brings something to the table and I'm delighted to be a part of it. Rabbi Steven Burg is the Managing Director of the Orthodox Union (OU) and the International Director of NCSY. 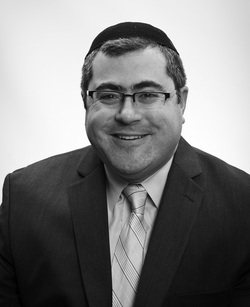 Rabbi Burg began his career with the OU over 20 years ago as a college advisor for NCSY. With Rabbi Burg’s vision and leadership, NCSY launched JSU, a network of over 200 public school Jewish culture clubs and TJJ, a transformative Israel summer experience for public school teens. As Managing Director of the OU, Rabbi Burg has developed greater programming synergy among the OU’s many branches and redefined the organization’s focus. A graduate of Yeshiva University, Rabbi Burg received his rabbinic ordination from Yeshiva University’s Rabbi Isaac Elchanan Theological Seminary (RIETS). He currently resides in Bergenfield, New Jersey with his wife Rachel and their six children, Aryeh, Elie, Devorah, Zevi, Natan, and Ayelet. 1. Why was YouthCon convened? Last year, some of my colleagues in the office, notably Duvi Stahler, Rina Emerson and Penny Pazornick, and I were looking for a conference, a festival of sorts, to celebrate and network within the emerging field of experiential Jewish education. From our experiences with NCSY and the Orthodox Union, we realized how important it is to share ideas and best practices with the broader field. From those discussions YouthCon emerged. 2. How can participants get the most out of YouthCon? People learn in a lot of different ways, especially those in the field of experiential education. If you go in knowing what is the best way you learn, you’ll come out with the most. If it's one-on-one learning, spend time at our mentor center. Otherwise, the schedule is set up in a range of topics and modes of presentation in order to cater to a large audience with varied approaches to learning. The most important thing is just to be yourself and enjoy. In real estate it's all about location, location, location. YouthCon is all about, people, people, people. I'm just excited to meet a broad range of people with different backgrounds and expertise. 4. You look fabulous. Just fabulous. No, no I really mean it. Where do you get your clothing? Your enigmatic sense of style? Thank you. Truly touching. A dear friend, Daniel Fiskus once told me, “It’s not about price. It's not about the brand. It’s all about fit.” Great clothes need to fit well, both in terms of your body and personality. I try to find pieces that present the characteristics I enjoy: The strategic gregariousness of Saul Goodman combined with the poise and focus of Gustavo Fring. I can only hope I succeed. 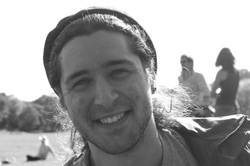 Dovid Bashevkin is YouthCon Program Director and Associate Director of Education for NCSY. Dovid studied in Ner Israel and Yeshiva University. 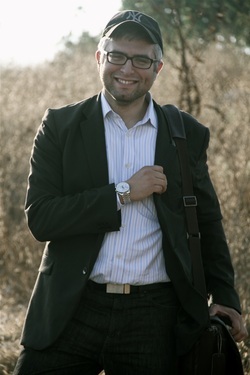 While in Yeshiva University, he completed a Master's degree in Polish Hassidut under the guidance of Dr. Yaakov Elman. He is also a struggling artist, investor and stand-up comedian. 1. What are you going to be speaking about this year at YouthCon? I am excited to be talking about how to use practical digital tools in the classroom and beyond. In the classroom, we will explore the latest EdTech tools and apps that can help give your educational environment more impact. For the "beyond" part, I am really looking forward to having a conversation about how we, as educators, can use technology, and social media in particular, to create a personal learning network of fellow educators that can serve as a tremendous resource. 2. Have there been significant changes in the world of digital media since last year? I think that the trend towards mobile has continued to develop at a rapid pace. More and more people are using smartphones, which, when you think about, are actually mini-computers. Mobile devices can and are playing a larger role in education, as classrooms shift from teacher centered instruction on a SmartBoard to a focus on students collaborating together and using their phones, iPads and laptops to research and create classroom content in new and exciting ways. As an educator, this shift is revolutionary as well. Having a smartphone in your pocket means that any time, in school or in line at the supermarket, there is an opportunity for on demand professional development, using social media tools. Definitely connecting with colleagues and meeting new people. When so many committed and talented educators gather together at an event like YouthCon, there is a buzz and energy in the room that is really invigorating and inspiring, and we take that back with us when we return to work in our schools and organization. It's really a credit to the vision of the OU and NCSY that they continue to find ways to connect us all, and really build a culture of sharing and collaborating among Jewish educators. 1. What will you be presenting on at YouthCon? I will be participating in a panel discussion in the Synagogue track titled: iProgramming: Synagogue Programming in the Digital Age. 2. Do you think a Synagogue's Youth Director can have an effect in guiding a child's life? The short answer: absolutely. I became a youth director because of the wonderful experience I had working in my childhood youth department under Youth Director, David Cutler, first as a youth group leader, then as an assistant youth director. In fact, David’s track record for his protégés is testament to the long-lasting impact a dedicated youth director can have — at least 9 of David’s youth leaders went on to become youth directors in the past 10 years. However, aside from the obvious positive impact that can result from supportive relationships between a youth director and individual youth members/leaders, the youth director is also in the unique position to create positive associations and warm memories of Shabbat, tefillah, synagogue, and community — for hundreds of children. Classical conditioning of emotion begins at the first moment of a new experience. Every factor that coincides with a youth event forms a psychological and neurological association; these associations inform the reaction and feelings children have towards similar events later in their adult life. It follows that a youth director who has created an environment in which tefillah is meaningful, parsha engaging and Shabbat the highlight of the week, has fostered powerful associations that can last a lifetime. The move to formalize informal education has received a lot of recent attention in the Jewish educational world. Increasingly informal education is viewed as a legitimate, respectable, professional career path — this is a wonderful shift. I am curious to discover how informal educators feel about topics previously reserved for the formal Ed world. Specifically I am excited to dialogue with synagogue and camp professionals about topics such as inclusion and special need programming; prevention of child sexual abuse; curriculum development and educationally substantive informal-ed programming; anti-bullying programs; family counseling; formalized leadership, curriculum and safety training for entry-level staff (e.g., camp counselors and youth group leaders); professional development for senior staff; and organizational management… to name a few. I believe that the sooner informal educators formalize their departments and programs by giving considerable thought to these areas, the sooner their role as serious, indispensible educators (worthy of competitive compensation!) can be cemented. And I believe that Youth Con, the largest gathering of informal Jewish educators worldwide, is an incubator for these sorts of conversations. 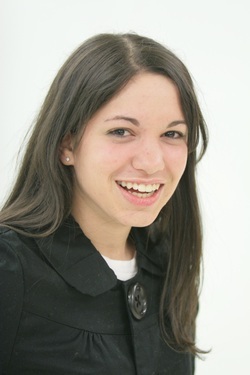 Shira M. Berkovits is a WINGS Youth Consultant for the Department of Synagogue Services at the OU and previously served as Youth Director of the Hebrew Institute of Riverdale. Shira has a Ph.D. in Learning and Behavioral Psychology from the Graduate Center, CUNY, where she was an Enhanced Chancellor’s Fellow and adjunct professor. Her dissertation focused on motivation in college students and her research on synagogue youth leader attendance was recently published. Currently, Shira is pursuing her JD degree at Cardozo School of Law, where she is a Monrad Paulson Scholar and intern at the Innocence Project. Shira hopes to combine her youth, psychology, and legal expertise in the defense and rehabilitation of juvenile delinquents. 1. Do you think bullying is an issue in informal education? Unfortunately, bullying is an issue everywhere. Bullying happens most in informal settings and with less adult supervision. It involves social group pressures, and the interactions between individuals. This makes informal settings a prime arena for teasing, harassment and social exclusion. Creating caring peer networks is, of course, possible. It means setting the stage, making it the “in” thing to do, building youth leadership and social responsibility, and challenging callousness or “blindness” to the social well-being of others. I believe most youth want to be leaders not followers, most want to be kind, not cruel, most want to make a difference. Informal education settings and programs provide ideal opportunities to create the environments and give youth the tools grow into socially responsible citizens. 2. Is there anything unique in bullying in the Jewish world? The Jewish world is a tiny one. Everyone knows everyone else. That means a young person who is socially excluded in one setting (like school) may be equally alone in other settings (camp, shul) because of the overlap of social networks. Also unique, however, is our mesorah, our powerful tradition of caring and inclusion. We have the opportunity to really live the words Kal Yisrael areyvim zeh la zeh and al taamod al dam reyecha. 3. What are you looking forward to most at YouthCon? I do the bulk of my work in Jewish schools, where no matter how committed educators are to social issues, they have important mandates to cover curriculum as well. I’m excited to meet with engaged informal educators, for many of whom the heart and soul of their work is addressing the social lives of youth. Rona Novick, PhD is the Director of the Fanya Gottesfeld Heller Doctoral Program at the Azrieli Graduate School of Jewish Education and Administration at Yeshiva University and Clinical Professor of Child Psychology at North Shore Long-Island Jewish Medical Center. 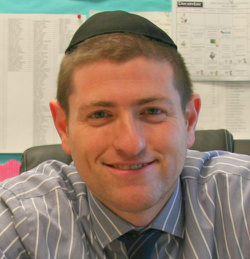 Dr. Novick also serves as co-educational director of the Hidden Sparks program, providing consultation to day schools and Yeshivas. 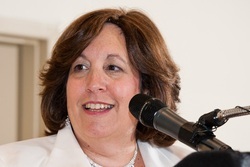 Dr. Novick developed the Alliance for School Mental Health at North-Shore Long Island Jewish Medical Center and served as its director for eight years, authoring the BRAVE bully prevention program for schools. Dr. Novick is a frequent and much sought speaker for both professional and general audiences. Her wit, warmth and engaging style, coupled with extensive knowledge in the fields of psychology, parenting, education and family life have earned her recognition nationally. She is the author of a book for parents: Helping Your Child Make Friends, and editor of the book series Kids Don’t Come With Instruction Manuals. Dr. Novick has made numerous appearances on local and national television and radio. As the mother of three sons, Dr. Novick credits much of her knowledge and skill to on the job training. YouthCon is a unique international program that helps Jewish education come alive by convening the most creative and innovative leaders of 2012. Participants are able to network and learn, surrounded by fellow youth professionals from all different geographic locations and backgrounds. 2. How does YouthCon help you in your position as Assistant Director of Synagogue Services at the Orthodox Union? A main goal of my department is networking and connecting synagogue youth professionals from around the country. At YouthCon, we are able to bring together synagogues, Jewish organizations, schools, and individuals and combine their efforts and talents to strengthen and reinforce the Jewish community at large. YouthCon provides a forum for the most creative minds in Jewish informal education and enables their creativity to flourish at the convention. Feedback from YouthCon 2011 and new components for this year’s convention including cutting edge speakers, consulting center, and interactive workshops are a few ways YouthCon will be brought to the next level. Penny Pazornick serves as the Associate Director of Synagogue Services at the Orthodox Union, where she began as a coordinator for the department. Synagogue Services provides resources, guidance, and expertise to over 800 synagogues across North America, enabling synagogues to grow and reach new levels of inspirational achievement. Penny created the Youth Professionals Network, a unique network that connects synagogue youth professionals across the country, provides programming resources and professional development opportunities. 1. As the head of the largest Jewish university, what do you see as the role of informal education? I believe that experiential education is an essential partner with formal, text-based, education in developing the full intellect, the full citizen, and the full Jew. I believe that young people must know their story and own their story, both of which happen by the combination of both experiential and formal Jewish education. 2. What is the greatest challenge facing Jewish educators right now? To instill a sense of Jewish passion, of a greater connection with both being a part of klal Yisrael and of connecting with God. And I think that consistency between school and home continues to be a very important matter. More than anything, my experience as a volunteer with Yeshiva University’s Torah Leadership Seminar programs shaped my life, not just my career in two important ways. First, I was able to see the impact that one could have if you use your skills to frame an environment and work with people more talented than you. Second, through a mentor that I had in Dr. Abe Stern z”l who was the Director of Youth Services for Yeshiva University, I saw someone who was dispassionately passionate, and that informed my life. I think it is very important to have the opportunity to be with others who share your passion and your sense of direction. I think I can gain strength from them, and I hope I can give strength to them. 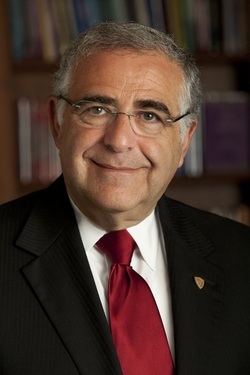 Richard M. Joel is the fourth president of Yeshiva University and the Bravmann Family University Professor. Appointed in 2003, his commitment has been to foster an environment that “ennobles and enables” the university community, with a renewed focus on academic excellence, enriched university life, competitive career and graduate-school placement, and a broadened commitment to the Jewish and wider communities. Throughout his career, he has stressed the importance of communal leadership and rich Jewish identity to ensure a Jewish future in America, in Israel, and around the world. Prior to his work at Yeshiva University, President Joel served as president and international director of Hillel: The Foundation for Jewish Campus Life and was an assistant district attorney and deputy chief of appeals in Bronx, New York. He was also an associate dean and professor of law at Yeshiva’s Benjamin N. Cardozo School of Law. He received his B.A. and J.D. from New York University, where he was a Root-Tilden scholar. He and his wife, Esther, live in Riverdale. They have six children and four grandchildren.